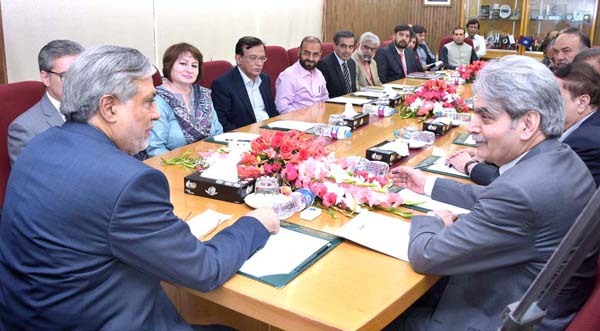 ISLAMABAD, July 15 (APP): Finance Minister, Senator Mohammad Ishaq Dar Saturday lauded Ashraf Wathra, the outgoing Governor of State Bank of Pakistan (SBP) for his services for the central bank. During a meeting with Ashraf Mahmood Wathra, who paid farewell call on Finance Minister, Dar congratulated him on the successful completion of his tenure. The Minister said that Ashraf Wathra remained committed to his work throughout his tenure and contributed significantly to smooth implementation of monetary policy and regulation of the money market. He praised the outgoing Governor’s professionalism and commitment, according to press statement issued by the Finance Ministry here. Wathra thanked the Minister for the support extended to him in undertaking and fulfilling his official obligations. Finance Minister on the occasion also welcomed the newly appointed Governor SBP, Tariq Bajwa and wished him well for his new assignment. Secretaries of Ministries of Finance and Commerce and other senior officials were also present on the occasion.